Twisted is an online, multi-player, boggle styled game for your Windows Phone. As with most boggle styled games, you are presented with a 4x4 grid of letters that you have to build as many words as possible within a certain time limit. You create the words by tracing connected letters to form the words. Letters have varying points values and some letters have multipliers. 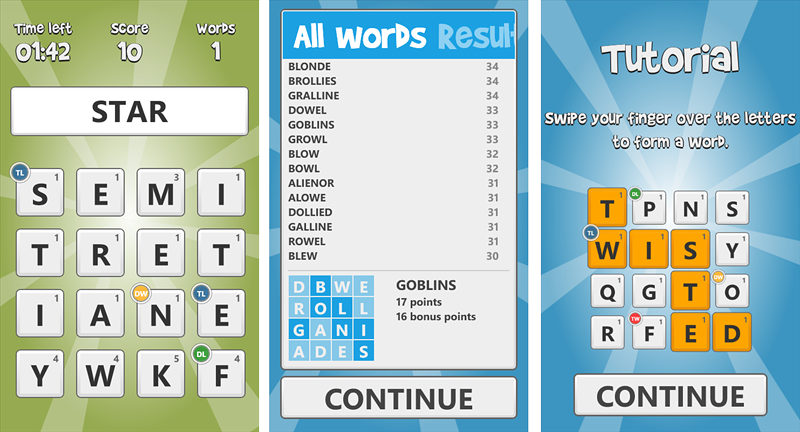 Twisted is very similar to the leading boggle styled game for our Windows Phone, Wordament. However, the game takes a different approach to the game. I don't think Twisted will knock Wordament out of the number one spot, but it does make for a nice compliment to your Windows Phone gaming library. Before you can play Twisted, you'll need to register (free) with your screen name, password and email address. From there you are sent to Twisted's Main Menu that has options to play the game, view your game statistics/leaderboards, access the game's settings, and view the about screen. Game settings cover sound on/off, turn on/off the tutorial, enable toast notifications, and enable the games live tile. You can also log in/out from the settings menu. Twisted's new game options include playing a friend from Twisted, invite a contact to play Twisted, randomly find an opponent and playing a practice round. Once you start a game with an online opponent you will see a summary of your games in play with an option to start a new game at the bottom of the screen. A game of Twisted consists of three two minute rounds where you have to find as many two or more lettered words as possible. Once you are done with your round, you wait until your opponent takes their turn on the same group of letters. Comparatively, Wordament is an multiplayer, online game that has everyone competing at the same time on the same group of letters for the best score. Twisted is simply a turned based version. Twisted is a challenging, entertaining game for your Windows Phone but I found it's enjoyment dependent on how quickly your opponent takes their turn. If you have a responsive group of opponents, Twisted's entertainment value is high. If you have a group of opponents that take all day to complete their turn, then the entertainment value is lower. This isn't necessarily a knock against Twisted, just a characteristic of turn based, online games. Speaking of online opponents, I did notice that at times it took a considerable amount of time for Twisted to find a random opponent. I'm not sure if this is due to a small player base or just a slow search process. Sometimes an opponent was identified right away but there were times it took hours to find a random opponent. If you like Wordament, you should give Twisted a try. 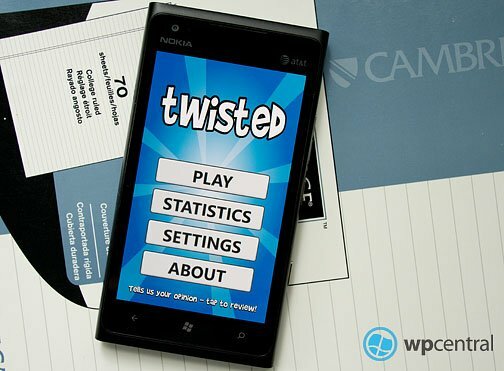 Twisted is a nice addition to your Windows Phone word puzzle gaming library. There is a free, full-functional trial version (ad supported) to let you try things out without cost. The ad free version of Twisted will run you $1.49. You can find it all here at the Windows Phone Store.